What can be better than a nice day’s sailing on the water? Relaxed after so much fresh air you head back to the harbour at the end of the day. Onboard you have the basic facilities, with the option to watch TV, listen to music, chill the white wine and charge your laptop or mobile phone. * The refrigerator runs for 1/5 of the time, resulting in an average of 10 watt. As compact and lightweight is important, a combined inverter/charger has been selected. The Mass Combi Pro fits perfectly into a Mastervolt system. 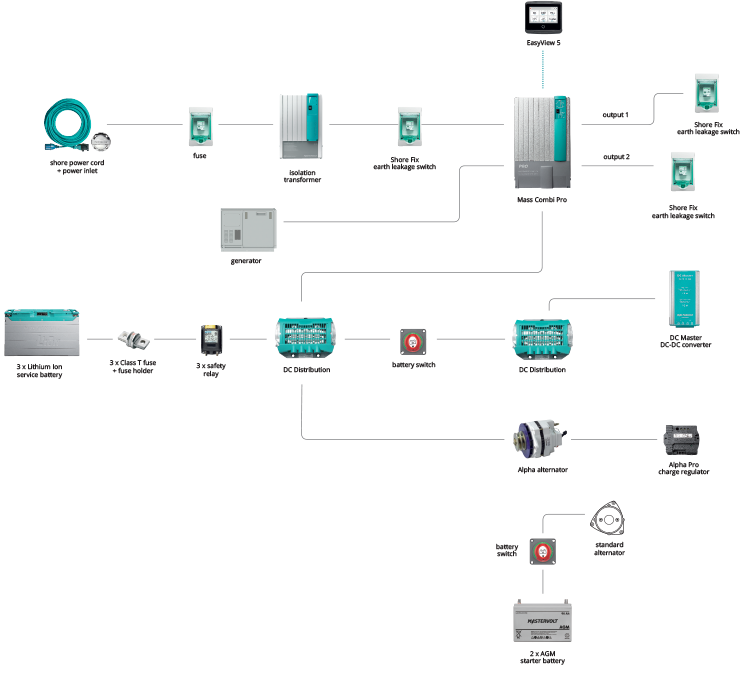 All components are easily connected via MasterBus and installation can be controlled and monitored intuitively, even with just one EasyView touchscreen. This will provide and manage all information about the Combi, the batteries and other sources such as the generator, grid or solar panels. The system is also suitable for Digital Switching, Mastervolt’s decentralised digital switching system. A battery voltage of 24 V is selected for this system to allow for smaller cable sizes. The total of AC and DC consumers requires around 4 kWh. The additional alternator can charge 1 kWh in half an hour. After four days, the batteries are discharged = 12 kWh (4x 4-1). Totally discharging the batteries is not advisable so opt for a maximum of 80 % discharge = 15 kWh. Taking into account the various appliances and required peak loads we suggest a 24 V system. The required battery capacity is 15 kWh. 432 Ah (3x 80 % x 180 Ah) needs at least 25 % of the battery capacity for charging power, so in this case we chose for a 100 A charging power via the Mass Combi Pro. The Mass Combi Pro has a battery charger that allows you to safely, quickly and completely charge two battery banks; starter and service batteries can be separately charged. Additionally the Mass Combi Pro can be used to convert the power for your AC applications, so using everything simultaneously is also possible. Waterproof system monitor with intuitive touchscreen. Thanks to the colour touchscreen and multi-language menu, the display is a pleasure to operate. Easily customizable favourite pages show all relevant system information at a glance. 2 x DC Distribution 500 This distribution model connects up to four DC devices to the DC groups, such as a battery charger, inverter, alternators and solar panels. 3 x safety relay 500 A.